This is the chilling video that captures a drunk woman's brush with death after she fell on to the tracks of an underground station into the path of an oncoming train. 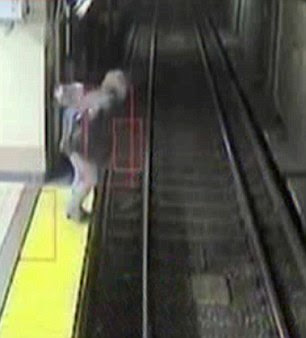 CCTV images capture the woman falling off the platform onto the tracks before horrified bystanders at Boston's North Station shortly before 11pm on Friday night. As the lights of a train can be seen approaching, the bystanders can be seen frantically waving to the driver in a desperate attempt to get her to stop. 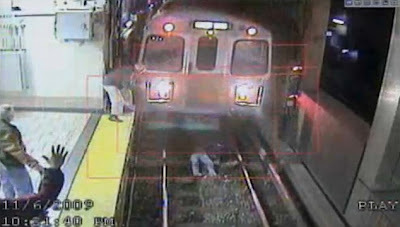 The woman lies motionless on the tracks, apparently having temporarily passed out. But the female driver of the train reacts instinctively, wrenching her emergency hand brake. The train comes to a sickening halt - partly over the motionless body of the drunk woman. 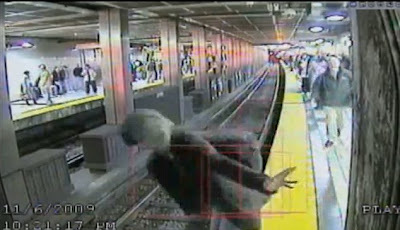 Half a second later she leaps out from underneath the train and clambers up the side of the platform. Train driver Charice Lewis, 27, said that, incredibly, the woman was smiling. 'I'm like, Oh my God, you really scared me,' she said as she recounted the chilling moments for reporters. Somehow the woman escaped with just scraped knees. Not only did she narrowly escape being run over, she also narrowly escaped being electrocuted, as CCTV footage showed her foot coming dangerously close to the electrified third rail of the tracks. The woman, who has not been identified, told police she had been drinking for several hours before. She was taken to hospital for evaluation. Ms Lewis was honoured for her quick thinking in the drama yesterday, receiving an award from Boston transport officials and a congratulatory phone call from the governor. 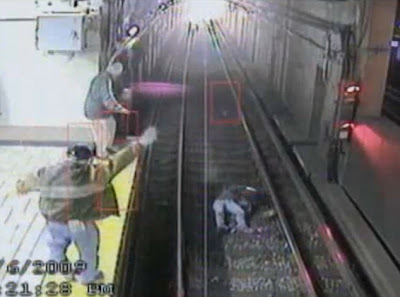 One bystander told the Boston Globe she had locked eyes with the woman as she fell onto the tracks. 'It looked like it was not going to end well,' she said.